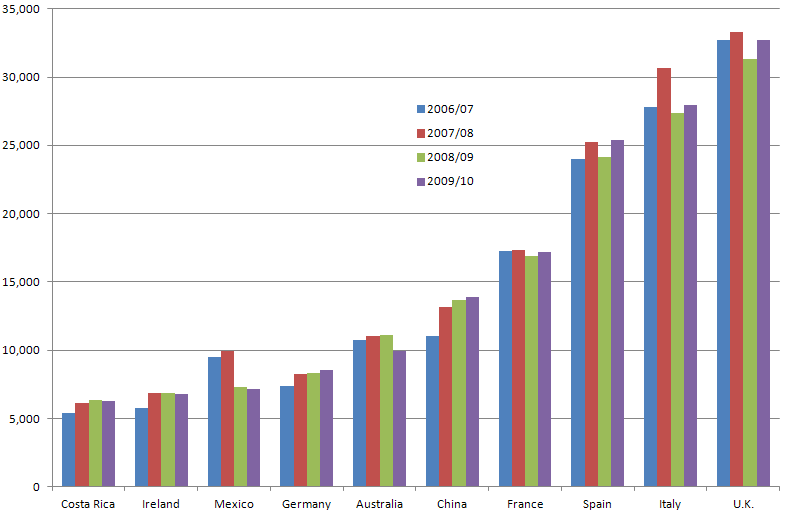 The top 10 destinations for U.S. students studying abroad were unchanged in the 2009–2010 school year compared to the year before. China remained in fifth place, with its numbers up only 1.7% over the previous year. By far the largest gains of destinations in the top 25 were those by Israel (60.7% — up to 3,146 visiting students) and India (44.4% — up to 3,884). Though not in the top 25, Taiwan also experienced very strong growth at 42.4% (850 students) — far higher than any other country in East Asia. In second place for growth in East Asia was Japan (6.6%), which will soon replace Costa Rica in the top 10 if trends continue. For places of origin of international students studying in the United States, China was by far the leader, with 157,558 students, about 50% more than India’s 103,895 students in the States. Third and fourth places were held by South Korea and Canada, respectively. Taiwan was fifth with 24,818 students. This entry was posted in China, Chinese, India, Japan, languages, Taiwan and tagged study abroad by Pinyin Info. Bookmark the permalink.